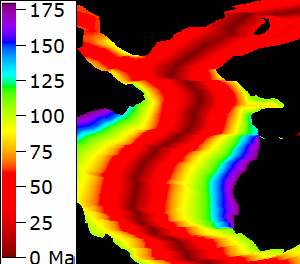 This data set (Muller and others, 2008) interprets the ages of the sea floor (ocean crust) based on marine magnetic anomalies, and plate motion models. It behaves like a DEM, but as you roam on it you get the age of the sea floor. Continental crust has an arbitrary age of 300 Ma, and there are several regions of missing data where the magnetic data does not produce reliable age estimates. There is a small area with the oldest crust in the Mediterrean Sea, which is a very complex region geologically. 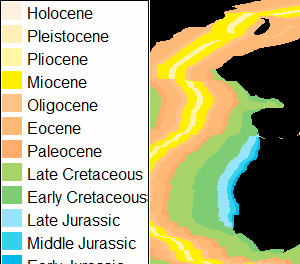 Otherwise the oldest oceanic crust is approaching subductions zones in the western Pacifiy. Predicted ages in millions of years, whih is what is stored in the grid. Color boundaries are isochrons, or lines of constant age. They are parallel with the orientation of the ridge that created them, offset along transform faults. 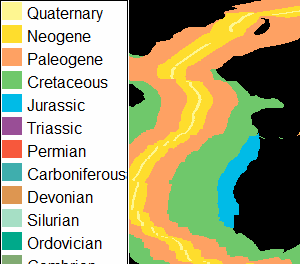 Select the display by right clicking on the map, and picking "Geologic ages". The coloring by period and epoch uses a database in c:\mapdata\database. Data source, citation, and download.